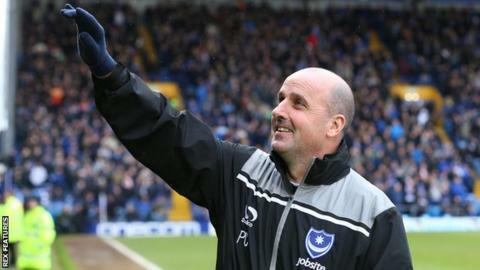 Portsmouth manager Paul Cook believes their 2-1 win over Cambridge will clear any gloom surrounding Fratton Park. Pompey returned to winning ways with only their second victory in seven matches on Saturday. And the result put Cook's side, who travel to Exeter on Tuesday, back into the League Two play-off places. "The win lifts the whole mood of the place and the last few weeks have been antagonising," the 49-year-old told BBC Radio Solent. "I felt we had to put in a performance with character. Everybody has felt pain here, everybody feels it here. "I was brought in to do a job and we are 32 games into that. The more we stay together, the stronger we will get." Despite the welcome three points, Cook lamented his side's continued inability to keep clean sheets, having failed to do so in any of their last 10 matches. "I would have gone to seven or eight at the back to keep a clean sheet," Cook said. "We still cannot keep a clean sheet and it is obviously a problem we have and it's disappointing one."